The 44th Thai University Games “Suranaree Games” has ended. Nevertheless, the 45th Thai University Games marks the first time that there will be RMUTT and Srinakharinwirot University Onglarak campus, in cooperation with Thammasat University Rangsit campus, hosting, which reflects the situation that merely having one University host is difficult, said Mr. Somkit Lertpaithoon, President of the University Sports Board of Thailand (USBT). Moreover, there is also another event this month – The 33rd National Youth Games (Chumporn-Ranong Games), which will be held between March 16th to 26th. In other news Thai football fans can rejoice as Thairath TV has received the rights to live broadcast the Thailand National Football Team between 2017-2020. The Football Association of Thailand (FAT) advocated Thairath TV due to the quality of their live broadcasts. Mr. Kiatisuk (Zico) Senamuang will remain the coach for another year. 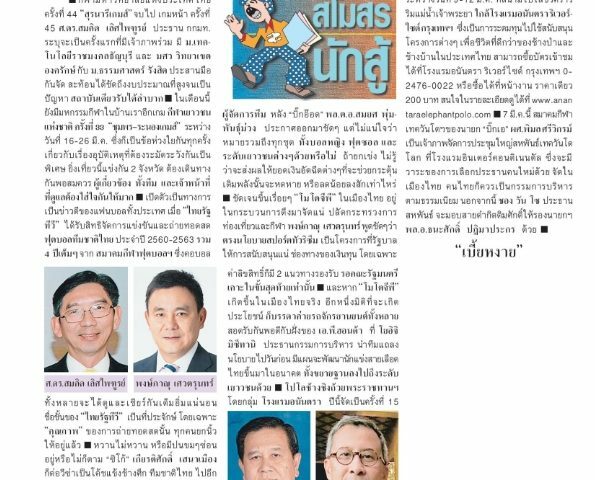 In addition, the Former national police chief Somyot (Big Odd) Poompunmuang clearly stated that the Thailand National Team does not have a manager. However, we are unsure if it includes the Girls National Futsal Team and various Youth National Teams, but it could result in reduced amount of funding to support the teams. Thailand is set to get a place on the 2018 MotoGP calendar. Permanent Secretary of the Ministry Of Tourism and Sports, Phongpanu Svetarundra, clearly announced that the MotoGP aligns with the sports tourism policy, is a government-sponsored project, and will receive funding. There are already two ways to support in terms of copyright. If MotoGP were to be hosted in Thailand, it will pose benefits for The Thailand Motor Expo and A.P Honda, stated in policies announced by Mr. Yoichi Mizutani, President of A.P. Honda Co., Ltd. the other day. There are also plans to host more Thai competitions and expand youth competitions. The 15th King’s Cup Elephant Polo, organized by the Anantara Hotel Group, will be held between March 9th to 12th by the riverside next to Anantara Riverside Bangkok Resort to provide funding to support various projects to better the lives of Thailand’s wild and domesticated elephants. Tickets can be purchased at Anantara Riverside Bangkok Resort by calling 02-476-0022 or in front of the venue for THB 200. Visit www.anantaraelephantpolo.com for more details. On March 7th, President Pimol Srivikorn’s Taekwondo Association of Thailand will be the host of the World Taekwondo Federation (WTF) Council meeting at the InterContinental Hotel in Bangkok to decide on the new President. If the event is organized in Thailand, by tradition, management should be Thai. Besides this, Mr. Song Wan Cho of Taekwondo Federation will present the honorary black belt to Deputy Prime Minister Gen. Thanasak Patimakorn as well.